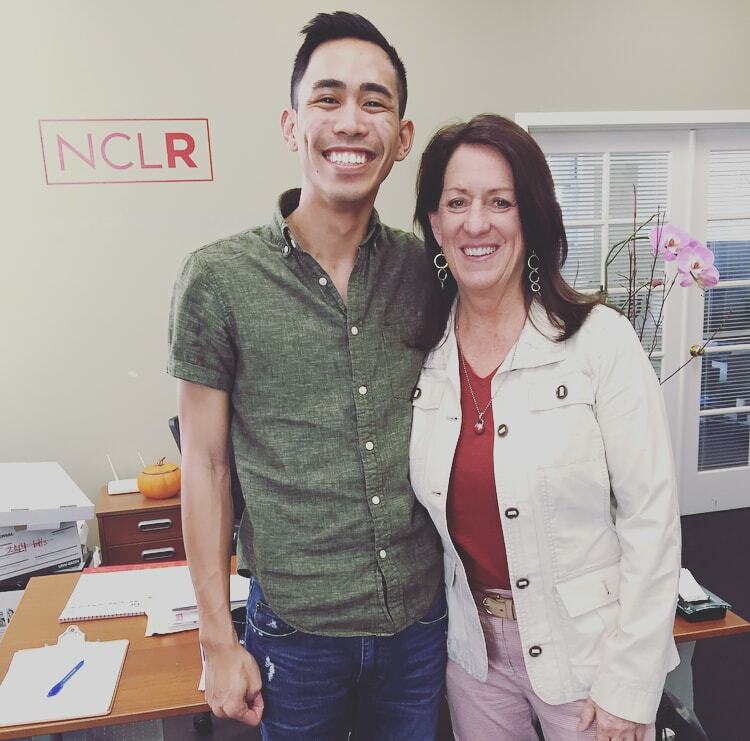 All of us at BKF are grateful to Kate for partnering with us during this busy time, mentoring emerging LGBTQ Rights leader and BKF Fellow Darren Arquero during her last year as Executive Director of NCLR. It is truly a special opportunity to have a fellowship run concurrently with a leadership transition like this and we are really excited to see how this will enrich Darren’s experience at NCLR. Darren begun his fellowship in January and is focusing on NCLR’s strategic communications efforts around key NCLR campaigns, including their challenge of the Transgender Military Ban and the Masterpiece Cakeshop case, which seeks to fight legally sanctioned anti-LGBTQ discrimination under the guise of religious freedom, and their Born Perfect campaign which is leading the effort to pass state-by-state legislation outlawing the use of conversion therapy on minors. Additionally, Darren will be launching a new project at NCLR to elevate the voices and stories of lesbians and queer women (both historical and contemporary) by showcasing stories that demonstrate the significant contributions they have made, and are making, to the cultural, political, and intellectual life in the United States. I remember the NCLR staff meeting when Kate announced she was stepping down as Executive Director after 22 years. The silence in the room was so sharp, as if we were all holding our breath… or maybe that’s what I was doing. In any case, it hit me like a ton of bricks, flashing back to Kate at the steps of San Francisco City Hall in 2008, and again in 2015; Kate rallying the crowd at SF Pride in 2016; and Kate in 2018, wanting to transition out of NCLR at a time that is ripe for a new leader—hopefully one that will be a woman of color. While saddened, I was excited to observe, listen, and take part in the process through which Kate, and NCLR as an organization, made public such a momentous announcement. To see the tremendous outpouring of love and support from LGBTQ leaders and organizations across the United States is a testament to the impact Kate has had on the movement, as well as the impact she’s had on people’s hearts. I am fortunate in that I not only am working closely with Kate during my fellowship, but have also been integrated into the NCLR team where there are many incredible leaders to learn from as I focus on NCLR’s strategic communications efforts. For example, working closely with Lauren Gray, NCLR’s Communications Director, has been an added bonus. She seems to always have a bird’s eye view of all the communications needs for NCLR’s program areas. Whether its interviewing survivors of the discredited and harmful practice of conversion therapy to support the passage of state laws forbidding the practice for the Born Perfect campaign, or keeping the public informed of the ongoing fight against Trump’s transgender military ban, Lauren gives me a good sampling of responsibilities that allow me to acquire new skills in communications for a national legal organization. I am excited to continue this year with Kate, documenting all I can about this experience as her BKF Fellow! 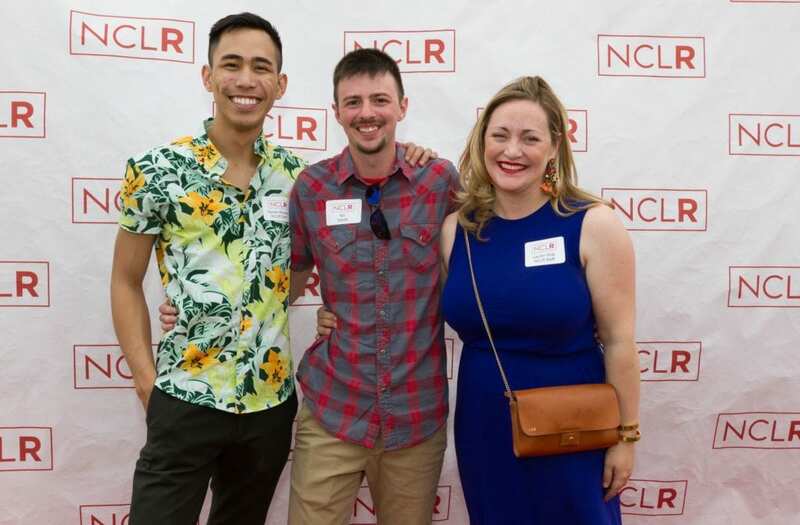 Darren Arquero (BKF Fellow), Nicolas Talbott (plaintiff in NLCR’s lawsuit agains Trump’s transgender military ban), and Lauren Gray (NCLR’s Director of Communications) at NCLR’s annual Palm Springs Garden Party fundraiser.